The Second Unitarian Universalist Principle states: We covenant to affirm and promote justice, equity and compassion in human relations. 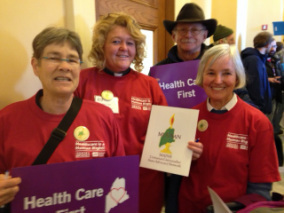 Health care for all: MUUSAN is an active member of the Cover Maine Now Coalition of over 100 organizations working to implement the Affordable Care Act. A Single-payer healthcare system: MUUSAN members are actively involved with the national coalition HealthCare-Now, organizing for a national single payer healthcare system. • Portland Press Herald editorial: "OUR VIEW: Vote YES on Question 2: It's a Good Deal for Maine"
It's time to pull out all the stops to GET OUT THE VOTE! Please volunteer! The Affordable Care Act (ACA) has set aside federal dollars for Maine to provide Medicaid coverage to approximately 69,500 people who would be uninsured otherwise. Adults with income up to 138% FPL ($16,105/year for an individual; $27,311/year for a family of three) would be covered, starting January 1, 2014. Full implementation of the ACA’s Medicaid option is a good deal for the State of Maine. The federal government will pay 100% of the cost of covering “newly eligible” individuals in Maine for three years, through December 31, 2016. After that, the federal contribution will be adjusted gradually until it reaches the permanent rate of 90% in 2020, far greater than the 64-cent rate it pays for current Medicaid members. Most working low-income adults with income below 138% of the federal poverty level can’t afford health insurance. They have little to no discretionary income and cannot afford the out-of-pocket expenses that people in health care Exchanges will have to pay, even with available. has dropped from 8th best in the nation in 2010 to 22nd in 2016. Candidates for the Maine legislature and for Governor should be able to tell voters how they would assure that every Mainer has access to comprehensive healthcare, and how their position would affect both the Maine economy and Mainers’ expenses. Would you vote to change Maine’s current profit-oriented healthcare system to a patient-oriented one, such as an improved Medicare for all? Why? How would you get all Mainers access to comprehensive medical care? Would you vote for Medicaid expansion in Maine? Why? fair tax program (like, for example, Social Security)? Why? What methods to contain Mainers’ healthcare expenses would you vote for? Prepared for Maine AllCare by William D. Clark, MD and Gail Eaton, MBA.